A friend and I decided on some late night sushi for dinner and found ourselves walking past Sushi Hana. The picture windows and lovely atmosphere brought us in. I had been there once before a few years ago but frankly didn’t really remember it and figured it was worth a second try. I loved the lighting fixtures which hang from the ceiling like stainless steel octopuses. The decor is really appealing, natural branches, sleek table settings and simple flower arrangements. Clean and simple, exactly the way I want my sushi to taste. 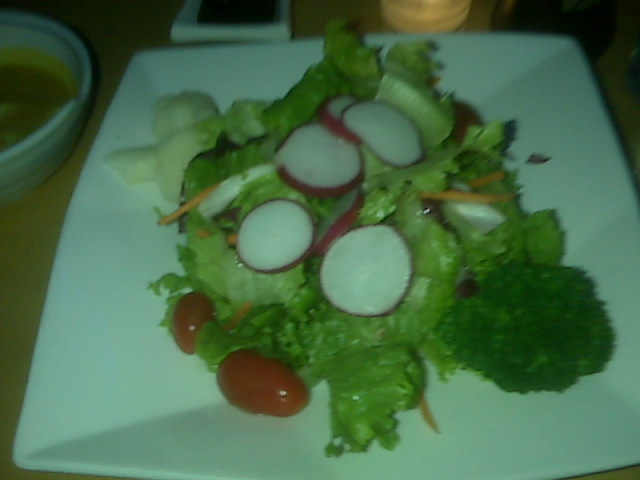 We each had a salad to start, and were pleased to see ‘real’ lettuce instead of iceberg, good tomatoes, carrots and radishes and a very nice ginger dressing on the side. 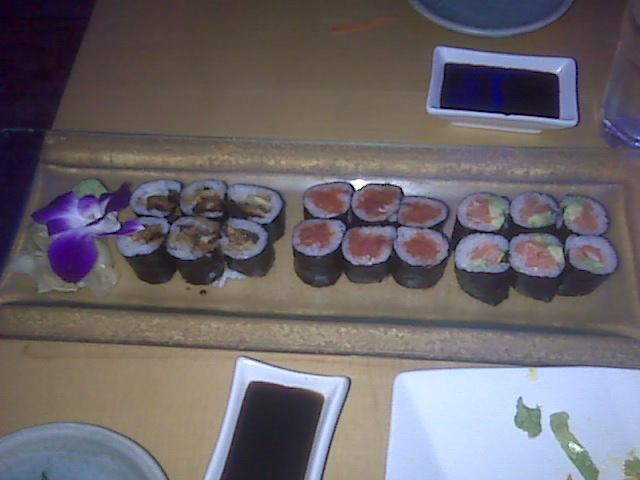 We shared 3 rolls with seaweed on the outside as I always request it. Eel with cucumber, spicy tuna and salmon/avocado. They were all good, but nothing special. The standard sushi you’ll find at any of about 40 restaurants on the UES. The wasabi, I will warn you, is EXTRA hot and we weren’t sure why- or what made it that way. The ginger was better than normal, and I wondered if perhaps they pickle it themselves. The service was attentive and quick and though she couldn’t really answer most of our questions, she certainly tried. We were rather entertained by the drunk guy on a date a few tables over from us. He kept yelling woooooohooooo and then getting yelled at by the middle aged couple sitting next to them. It was really quite amusing to me, but I couldn’t figure out why his cute date tolerated it instead of taking off. All in all, this restaurant fine. Nothing to write home about, but nothing to avoid either.